🐱 I have two cats, Dinah and Hamilton. They are both rescues, but Hamilton is eternally skiddish and was born without a tail! He was named after a street names after the president, not the play! Dinah was named after Alice’s pet cat from Alice in Wonderland. In 2013 my now husband and I picked up and moved to Knoxville, Tennessee leaving my desk job behind. The year we lived there we discovered how much we loved hiking and we got engaged on top of House Mountain as a bad case a step throat was starting to hit me! The first time I ever tried yoga, I hated it! I fell in love with it years later when I discovered its magic of relieving my constant neck pain caused by scoliosis. Bicycling has been a hobby of mine all my life, but I was too afraid to bike when I moved to the city. It took one panic attack on the blue line to get past my fear and start riding again! 🌈 In addition to teaching adults, I also teach kids’ yoga. Working with little ones has helped show me how important it is to just let go, be silly and have fun! I love stepping into their world of make believe and leaving practicality behind. 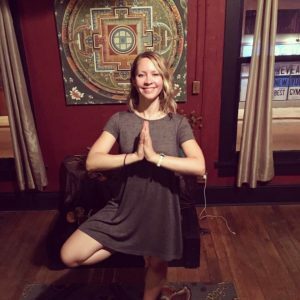 As a certified yoga instructor through YogaView, Christy was trained with a heavy emphasis on alignment, philosophy and meditation. A teacher to both adults and young children, she finds the light-heartedness and unpredictability of teaching children to be extremely valuable when teaching all ages as well as in her own life. Christy is always looking to learn and expand her own practice to be a better student and teacher. She seeks to share yoga with others to aid them in quieting their physical and sometimes emotional pains, and truly believes that yoga is for every age and every body.